Female gamers find community and a place to combat gender inequality in gaming through live streaming. There are two doorways out of the room, but Andrea Stone cannot escape. Two armed men stand in each doorway, but neither of them intend to kill her. Standing still, the men wait patiently. “You can’t stay here forever, you have to shoot one of us,” says one of the men to Stone. She knows what she has to do next will come at a heavy cost. Nevertheless, Stone aims her gun and presses the trigger. Stone is subsequently banned from the match for shooting one of her own teammates. Like many women in the gaming community, Stone, 21, has often experienced gender discrimination while playing online games. 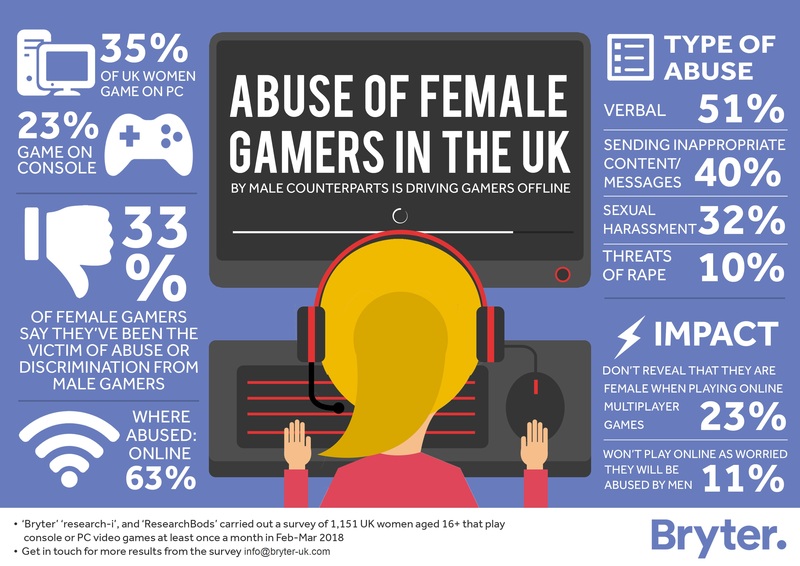 According to a Bryter survey, one in three women reported experiencing discrimination or abuse at the hands of male gamers. However, Stone and other female gamers belong to a community on Twitch, the popular live streaming platform, where they find some refuge. Women on Twitch have encountered a lot of gender-related controversy in the past, ranging from issues like dress codes to hate speech. However, Twitch is shaping up to be an effective weapon in the fight for equality, with more women joining as both streamers and viewers each month. "People will say and do anything when they're behind a screen, typing away at their keyboard." Contrary to the popular misconception that most gamers are male, many studies have shown that the ratio of female to male gamers is relatively half and half. Females make up 45 percent of the gaming community, according to The Entertainment Software Association’s 2018 annual report. This data refers to video games across all mediums, including mobile games, console games, PC games and more. Born and raised in Whitney Point, N.Y., Stone has been playing video games since grade school. In her free time, Stone considers herself a dedicated gamer; her bedroom serves as the ultimate gaming hub, a physical manifestation of her passion for playing. TV and computer monitors cover her entire front wall. In front of the screens, Stone has built a custom entertainment center with a light-up rainbow keyboard and a high-tech mouse to match. Stone began playing Counter-Strike: Global Offensive (CS:GO) in 2015. CS:GO is a multiplayer first-person shooter game. It allows players to play and strategize as five-person squadrons to eliminate a competing five-person team. When the 45-minute match began, Stone had decided to queue with random players. Once she was matched with a squad, she was able to voice-chat with her new teammates over Steam, a social networking service for gamers. Sporting a matte black headset on her cropped black hair, Stone switched her microphone on to greet her new team members. As soon as she began to speak, one member of her squadron interrupted her mid-sentence. “Girl gamer!” said a male voice. The rest of her teammates joined in to mimic her voice, relentlessly harassing Stone until the game began. Later in the match, Stone found herself cornered in a room by two of her own teammates. In CS:GO, it is prohibited to shoot another member of your squadron. Doing so initiates a player penalty and bans the offending player from the match. Stone’s teammates had used this rule against her by blocking the exits, thereby forcing her out of the match when she had to shoot one of her own team members to escape. “People will say and do anything when they’re behind a screen, typing away at their keyboard. I kept playing, but I didn’t turn my mic on again for a long time after that,” says Stone. Sitting at her bedroom desk, Giulia Milana, 21, holds a plastic game controller in her trembling hands. Milana is a broadcast and digital journalism senior at Syracuse University. Her dark waves of hair are held back by a thin elastic. Two computer monitors illuminate her face, but Milana’s gaze is cemented exclusively on the left screen. On the left monitor, a glowing treasure chest bursts open to unveil high-grade artillery and sustenance for survival. Milana quickly places the supplies in her backpack before exiting the building. Despite the booming blips of gunfire outside, Milana must run before the storm sets in or eliminate her enemies before time runs out. Milana is one of nearly 80 million people playing the video game Fortnite across various digital platforms, according to an August 2018 report from Epic Games, Fortnite’s creator. To anybody who enters Milana’s bedroom, Milana appears to be alone. Behind the screen, however, dozens of viewers are tuning in to watch her compete in a girls-only Fortnite tournament hosted by Twitch celebrity Nick Kolcheff, more commonly known by his Twitch handle @NICKMERCS. With over 2.3 million followers on Twitch, Kolcheff is Milana’s all-time favorite streamer. Milana’s right-side computer monitor is a command center for her live stream account. When viewers enter Milana’s stream @giuliaaa on Twitch, Milana is able to control what her viewers see when they are watching. Giulia Milana, an SU senior, talking to her Twitch viewers during one of her 24-hour streams. Twitch is at the frontlines of a new kind of reality programming, one that attracts male and female viewers alike. In January 2018, an average of 962,000 viewers were actively on Twitch at a given time, a number comparable to the viewership of major television networks like Fox News and ESPN, according to a Business Insider report. In recent years, female gamers have been increasingly shifting into the Twitch spotlight. One of the most famous Twitch streamers to date, female Fortnite player KittyPlays, has just under 1 million followers. As of December 2018, she is the 59th most followed Twitch streamer, according to TwitchMetrics. After joining in the Fortnite frenzy that ensued during the fall semester of her junior year in college, Milana began playing for two to three hours a day in her bedroom after she returned from classes. She started viewing other Fortnite streamers on Twitch to improve her gameplay. Milana remembers one instance in which she found herself grimacing while watching a well-known female Fortnite player’s live stream. “She was probably making hundreds of dollars a day. This girl’s not even good at the game, but people are watching her… I’m good at this game. So I might as well… get my name out there and build a new community,” says Milana. Milana invested around $2,000 purchasing new gaming and streaming equipment over a several-month period. She began streaming on a regular basis in August 2018. Today, Milana has just under 700 followers, but she is still 300 followers short of her year-end goal. As of December 2018, Milana has made hundreds of dollars through donations and subscriptions on Twitch. Twitch allows viewers to comment in a public chat box while streams take place. In one clip on Milana’s profile, Milana’s eyes are watering after gaining 100 new subscribers. “I could literally throw up right now,” says Milana in her stream. Her hands cover her mouth in shock, but even this can not hide her excitement from her viewers. “[You’re] like Santa on December 1st,” says one commenter in response to Milana’s delight. Whenever Milana encounters inappropriate comments while streaming, Twitch gives her and other streamers the power to suspend a user from commenting or even ban a specific user from her streams. With this threat in tow, Milana rarely needs to reprimand her viewers. "Like a lot of other male-dominated spaces, the Esports industry hasn't always been very kind to women." While Wisconsin native Dana Grave’s girlfriends tune in to watch the latest episode of Keeping Up with the Kardashians after work, Grave can more often be found logging onto her computer to watch her favorite streamers. “[It’s] like logging on to Netflix for a show you like, except it never ends,” says Graves, 24. “Every time Twitch streamers log on, the gameplay they experience online is different, and the stories they have to share are new.” During the summer months, Graves plays Twitch streams on her TV all day long. KittyPlays: The most famous female streamer on Twitch, she is well known for her positive attitude and engaging personality. KayLovesPie: Kay-Chan plays a variety of games on her stream. She likes to show her love for her fans by hosting fun giveaways. Becca: Becca is a professional League of Legends player. She is often recognized amongst her fan base for her infectious laugh. Pokimane: Another top female streamer on Twitch, Pokimane mainly plays League of Legends. She is known for often cracking jokes and telling stories on her stream. This past semester, Olivia Stomski, a professor at Syracuse University’s S.I. Newhouse School Of Public Communications, offered a new course titled “Esports and Media.” The first course of its kind, Stomski and Professor Chris Hanson collaborated with Twitch to build the course curriculum. “Having the community, the audience interaction and the variety of content is what sets Twitch apart,” says Stomski. She mentions that she goes on Twitch daily for research and educational purposes, but Stomski often finds herself staying on longer than she originally intended. Subsequently, Stone began to use Twitch one month after she turned her microphone off. While browsing CS:GO streams, she came into contact with another player named Jake. Befriending him, Stone ended up joining his CS:GO team. She has turned her microphone back on since joining Twitch and finding a regular squad. “I only watch streamers that I would hang out with in real life. A lot of the times, those streams are where I’ve met new online friends,” says Stone. Stone gets home from work, and her computer buzzes. Her teammates are calling her to log on for one of their weekly matches. In 2018, the most followed streamer on Twitch, Richard Tyler Blevins, commonly known as Ninja, announced that he would no longer play with women, according to BBC News. Blevins explained his decision, citing his marriage and his proactive measures to avoid internet gossip. Despite this, the decision garnered split reactions throughout the Twitch community, with many people labeling his decision as sexist and others supporting the claim that streaming with women while married would not go over well in the internet’s toxic climate. On Dot Esports, Carpenter specializes in writing about the game Overwatch. Carpenter, 30, has been an Overwatch player since the game’s release in 2016. Released by Blizzard Entertainment, Overwatch is a multi-player hero shooter game that allows its users to create and play as a character with supernatural abilities. One of Carpenter’s favorite aspects of Overwatch is its gender-diverse fanbase. “[Overwatch] isn’t 50/50, but it’s closer than other games. It makes a difference. Women seem more allowed to participate… Like a lot of other male-dominated spaces, the Esports industry hasn’t always been very kind to women,” says Carpenter. As of now, female gamers have numerous levels to beat in the battle for gender equality. And although Twitch is still far from becoming a female-friendly environment, the site is the first step in allowing women to have a platform, to find a community, meet new people, and, most importantly, to say to the rest of the gaming world: Game on. is the Life & Style Lead Producer for The NewsHouse. She is also the Web Design Director at Zipped Magazine.